Most organizations don't consider how much of their reputation and successful operation depends on secure computer systems - until those systems are compromised. Too many companies have found out the hard way that the most valuable assets they own are not their inventories, their petty cash drawer, or their company cars. Instead, the information about their business - payroll, customer records, sales prospects, business plans, patent applications - is the truly irreplaceable asset. Loss of your company's valuable information cannot be undone, and also often leads to significant damage to your company's reputation. Without constant vigilance, your company is vulnerable to attack. The first step to take is to assess your current security stance, then make a plan to increase security with proper best practices and technologies. Limit access to information to those who need to have it -- People can't misuse information that they don't have. Conduct frequent and deep security audits - Identify who has access to what - and how their actions could weaken the protection of valuable data/information. Set limits to information access - do not exclude all information from access - data exclusion locks down access. Limits set authorizations so specific people can do specific things under specific circumstances. Limit administrative rights to as few individuals as possible -- very few individuals need them to do their jobs. Ignore organizational hierarchy when setting access capabilities - access and authorization should be based upon responsibilities, not position. Make Security Invisible -- Minimize extra commands, screens, pop-ups for employees; if an action is allowed, just let it happen. Analyze Security End back doors -- Compliance logs reveal threat patterns, and show how security steps are hurting productivity. Monitor information access and updates-- User-initiated application information updates can invite vulnerabilities. Make security best practices the watch word for everyone -- IT and the general workforce must address the constantly changing nature of security breaches. This Security Policies and Procedures Manual for the Internet and Information Technology is over over 230 pages in length. 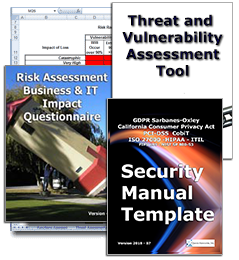 All versions of the Security Manual template include both the Business & IT Impact Questionnaire and the Threat & Vulnerability Assessment Tool (both were redesigned to address Sarbanes Oxley and CobiT compliance). In addition, the Security Manual Template PREMIUM Edition contains 16 detail job descriptions that apply specifically to security and GDPR, Sarbanes Oxley, ISO 27000 (ISO27001 and ISO27002),CobiT, PCI-DSS, and HIPAA. Data Protection is a priority.